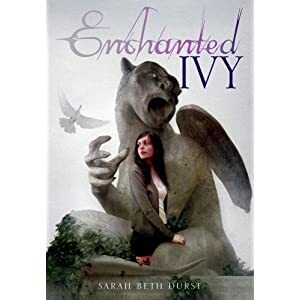 My pick this week is Enchanted Ivy by Sarah Beth Durst.
" Lily's test is to find the Ivy Key. But what is she looking for? Where does she start? As she searches, Lily is joined by Tye, a cute college boy with orange and black hair who says he's her guard. That's weird. But things get seriously strange when a gargoyle talks to her. He tells her that there are two Princetons—the ordinary one and a magical one—and the Key opens the gate between them. But there are more secrets that surround Lily. Worse secrets. When Lily enters the magical Princeton, she uncovers old betrayals and new dangers, and a chance at her dream becomes a fight for her life. Soon Lily is caught in a power struggle between two worlds, with her family at its center. In a place where Knights slay monsters, boys are were-tigers, and dragons might be out for blood, Lily will need all of her ingenuity and courage—and a little magic—to unite the worlds and unlock the secrets of her past and her future." Wow..That book cover is creepy but really stunning! I agree, that cover is very attractive. I hope it's good. I'm so excited for this title as well! It sounds so good!